It wasn't Henry's fault. It wasn't his parent's fault. It wasn't anybody's fault. It could have happened to anyone of us. "But for the grace of God go I" kind of thing. I'm sure Henry's father and mother, whoever they were, were nice people and did the best they could to raise Henry right. It must have been difficult for them, too, since they had to live in a small, rural village where everyone else knew their business as well as they knew their own. It must have been hard on his brothers and sisters, if he had any, considering how cruel children can be to one another at times. Henry didn't mean to be the source of embarrassment to anyone - especially his own family. Henry couldn't help the way he was born. He didn't ask to be made an imbecile. But that's what the Army said he was. Even though Henry tried his best to be a good soldier, the military did not want any part of him and got rid of him just as soon as they could find a good excuse. There was just not much detailed information to be found in the public records about Henry's early life. He said he was born in New Haven around 1823 when he enlisted in the Union Army. Nothing could be found out about his parents, not even their names let alone where they came from or how they made a living. Just as little could be found about any siblings Henry may have had. It was pretty obvious from Henry's military records that his wheel was missing a few spokes. Equally obvious was that Henry, being simple-minded, had to have more assistance from other adults than normally required in order to raise and care for him. His ability to live independently the help not only of his parents, but also unrelated members of the community in which he lived, whether that was New Haven or some other town. Someone, either voluntarily or paid, had to be available twenty-four seven to help guide and manage Henry's affairs. This peculiar situation may explain why it was so difficult to find the customary resources in the public record that would have told the story of Henry's youth. Base on a few tid bits of information unearthed about Henry, and filling in the gaps with some assumptions, it can be fairly secure to say that Henry was a native son of New Haven as he, himself stated upon enlisting in the service. He spent most of his life living in and around the village which is why he lies buried in one of its cemeteries. When he was discharged from the service, he requested any correspondence for him be sent to Ripton, Vermont. The 1880 U.S. Federal Census placed him living in Bristol, Vermont under the roof of his brother-in-law. With minor variations at times in his adult life, Henry's residence in Bristol and New Haven were the only two which could be verified. The early years of Henry's life were pretty poorly documented and the adult portion was not accounted for much better. When Henry enlisted into the army late in the Civil War, a paper trail began to appear that allowed one to trace his movements more precisely. Henry was thirty-nine years old when he signed up for military duty May 20, 1864. Why he wanted to do so and why he waited so late to do it were two questions without answers. Also an enigma was why he went all the way to Reading, Vermont to enlist when he was, most likely, living in New Haven. But that's what the compiled service record for Henry said. His paperwork also stated that he was a farmer, was born in New Haven, Vermont and stood five feet seven inches tall. He had a light complexion (unusual for a farmer type), blue eyes and brown hair. Henry wasn't actually mustered-in until July 6, 1864 in Burlington, Vermont. The bounty being paid at the time was $100 per man. Henry got $25 of it up front and a month's pay ($13 Fed plus $7 State) in advance. The history of this regiment was just as peculiar as the personal story of some of its soldiers. The Seventeenth Vermont was the last Civil War regiment raised by the State. Its birth was almost shrouded in mystery; its infancy and early life was a continual struggle for existence. For many months, its growth was so painfully slow and rocky that it raised grave doubts that it would ever reach maturity as a fully organized regiment. The Seventeenth was organized by the State as the last regiment from Vermont to respond to the President's call for 300,000 more men to fill up the regiments in the field. It began its organized existence July 2, 1863 with Vermont Governor Holbrook's authorization. Gettysburg had just been fought and the authorities wanted to take advantage of the surge in pride and glory the victory over Lee's army created in the veterans and the nine months men whose terms of enlistment had just run out. They hoped this stand against the Confederate's attempt to invade the North would result in an eagerness to continue the lesson the Rebels had learned on the Pennsylvania fields. But the flush of victory and the sweet taste of defeating the unbeatable Robert E. Lee did not produce the hoped for wave of eager re-enlistments and recruiting slowed to a frustrating trickle. If Henry had waited a few months, he could have collected three times his $100 bounty. Realizing victory in the field was not producing the desired effect on re-enlistments, the Federal Government raised the signing bonuses to $302 for new recruits and $402 for veteran re-enlistments. Recruitments soon increased with the new incentives in place. Nearly every town in the State contributed to the regiment's ranks. The blend was so mixed that it was difficult to identify a specific locality from which each company was raised, like in the past when whole companies came from the same town. Enlistments began as early as August 21, 1863 and ended September 22, 1864. The Regiment was mustered into the service in dribbles and drabs, mostly by squads rather than by companies. The first detachment, a battalion of seven companies, left Burlington April 18, 1864. The Regiment began at once its active service, going almost directly from its rendezvous in Connecticut to the battlefields of Virginia. It reached Alexandria, Virginia on April 22. April 27 it marched for Bristoe Station, stopping for the night at Fairfax Court House. On May 4, it passed through Bealton Station then on to Rappahannock Station and, on the same day, crossed the Rapidan at Germenna Ford. The measles were breaking out in the Seventeenth and, with the hard marching which the recruits were un- accustomed to, reduced their numbers down to 400 effectives when they halted on the battlefield of The Wilderness. Ignorant of the carnage of the first day's fight on May 5 as well as what was in store for them on May 6, the men, foot-sore and exhausted, threw themselves down on the ground to sleep and rest. Soon after midnight, they were awakened and by 2 a.m. were being placed in the center of the Union line preparing for the general assault to be made at dawn. The Seventeenth, had the right of the Union line as the advance was made through woods and open fields until the skirmishers struck the enemy's line. They were then forced back by the pressure from the Rebels. At about 9 a.m., the Regiment attacked through the pine undergrowth, at times on their hands and knees, and drove the enemy from behind their breastworks and occupied the ground they abandoned. The Seventeenth found themselves out in front of their own lines and without any support. They managed to hold their position despite attacks on both of their flanks. About 2 p.m. the brigade was given orders to charge the enemy positions. The Regiment moved out rapidly, passing over their own troops lying in front of them and drove on the enemy. Two hundred prisoners were taken in the charge. In this, its first battle, the Regiment showed the same high qualities of courage, daring, coolness and persistency which had made the First Vermont Brigade so famous throughout the entire Union Army. Its losses were ten killed; sixty-four wounded, ten of them mortally; and six missing - a total of eighty out of three hundred thirteen men. From the Wilderness, the Seventeenth moved out with the rest of the corps towards Spotsylvania Court House. On May 12, the Vermonters were part of the assault on The Salient. The 24th the Regiment crossed the North Anna and entrenched under constant Rebel fire for the next two days. On the 30th, it advanced to Totopotomoy Creek and the next day drove the enemy from their works, sending them running towards Cold Harbor. The Regiment was spared the action near the Bethesda Church, June 1-3. It was here that anything that moved or showed its head above the trenches was a fair target for Confederate pickets and sharpshooters. On June 12, the corps was withdrawn in the darkness and moved towards the James River. The Regiment was halted for twenty-four hours, waiting for the bridge to be laid and the wagon trains to come up as rations were short. On the 15th of June, the Seventeenth took up the line of march for Petersburg once again. That night, the pace of the march was so severe that when the halt for breakfast was ordered, not a company of the Regiment had more than eight men in the ranks left to stack arms and some had only four. After a short rest, the march was resumed and, about noon, having covered twenty-two miles, the Seventeenth finally stood before Petersburg. Before nightfall, the Regiment with the rest of the brigade was in line of battle, ready to support the Second Corps' assault on the enemy's entrenchments. The assault was only partially successful, capturing a few of the outer defenses of Petersburg. During the night, without sleep, a dawn attack was prepared. At the first light of day, orders were whispered along the line, men sprang to their feet, not a shot was fired as the day was to depend on the use of the bayonet. The Yankees rushed forward and over the breastworks before the sleepy Confederates could become half awake and realize their danger. The charge was successful and resulted in the capture of 600 prisoners, 1,500 stands of arms, a stand of colors, four pieces of artillery, caissons and horses. Many of the prisoners were taken by the Vermonters of the Seventeenth. In fact, among those Rebels captured by the Green Mountain Boys were the Seventeenth Tennessee - some seventy men, their Adjutant and their colors. But all those achievements came at a price. From June 25 to July 21, the number of men fit for duty dropped from 250 to 150. July 30, 1864 was the date of one of the Civil War's most singularly significant events - the explosion of the mine under Elliott's Salient known to history as the Battle of The Crater. This attempt to break through the Confederate defenses around Petersburg only resulted in more casualties for the Seventeenth. It now hardly numbered one hundred men, many of them under the surgeon's care, and was commanded by a captain. By September 1, however, with new recruits being sent to the ranks, there were 233 present for duty. During most of September the Seventeenth enjoyed duties of a less dangerous nature. Then someone decided that the Johnnies needed to be driven away from certain roads south west of Petersburg about five or six miles from the city. An assault was planned on the Confederate works near the junction of two important roads near a farm in the area owned by people named Pebbles. In one of those inexplicable blunders that sometimes happened during the war, a gap developed in the Union offensive line as it advanced. The Confederates noticed it and immediately ordered troops of their own to fill it, splitting the Union forces and allowing the Rebels to get behind the blue line where they could attack them from the rear and on both flanks. The discovery of the enemy behind them created panic in Yankees. Orders to fall back were issued. In the attempt to fall back, many of the brigade were killed, wounded or captured. Before October 27, 1864, the Seventeenth Regiment was down to one captain and eighty-four rank and file. On October 27, Company K commanded by Captain Yales joined the Regiment with ninety-five fresh recruits. From the fall of 1864 to the fall of Petersburg April 2, 1865, the Seventeenth was spared from most of the intense fighting left in the war. It spent considerable time garrisoning Fort Davis and took part in frequent skirmishes between pickets, varied with occasional artillery duels, but no pitched battles. At Petersburg, the Regiment performed at its usual high level, living up to the reputation for fighting established early in the war by the Old Vermont Brigade. At least five officers were brevetted for gallantry. On the 3rd of April, the Regiment passed through Petersburg and took up the march in pursuit of Lee. Receiving word of Lee's surrender on the 9th of April, the Regiment returned to Burkesville to guard the immense quantities of captured property and numerous prisoners. Eventually it was sent to Alexandria where it went into guard and patrol duty, taking part in the Grand Review in Washington on May 23. On July 14, the Seventeenth left for Vermont, arriving at Burlington on the 18th. The original members of the Regiment numbered 869. Recruits amounted to 232 plus five transfers from other regiments. Total enrollment added up to 1,106 men. One hundred thirty-three were killed in action or died of their wounds. Another one hundred sixteen died of disease; three from accidents and thirty-three died in Confederate prisons for a total of two hundred eighty-five deaths. Three hundred fourteen men were wounded. Three hundred eighty-six other men were lost to the Seventeenth by causes other than death. Seventy-two men were captured by the enemy. Private Kellogg was a late bloomer in so far as his initiation into the Civil War was concerned. He may have been present with the Seventeenth when it was part of the infamous mine explosion at Petersburg. He was definitely present for the Weldon Railroad engagement August 18-21. It was there that he was "taken with a severe inflamed eye" on August 18, 1864 "and was sent to Hospital and lost use of his eye". While being examined by the hospital surgeons, it was discovered that he also suffered from "varicose veins at the time of enlistment". These ailments and injuries had put Private Kellogg out of commission for at least the past sixty days when the decision was made that he was "incapable of performing the duties of a soldier because of "varicose veins. Imbicility (sic)& Incipient Pataracity. The Cataract was contracted in the service. The varicose veins & Imbicility existed previous to his enlistment. Disability 3/4. Not a fit person for transfer to the Veterans Reserve Corps." Private Kellogg had only been with the Regiment for four months, been involved in just two engagements at most, and been in the hospital for two of those four months of active duty. It was his diagnosis of imbecility that was the key factor in his being given a disability discharge on December 17, 1864 at Fort Davis near Petersburg, Virginia. Private Kellogg was an undesirable recruit for Mr. Lincoln's army and was sent home as such. 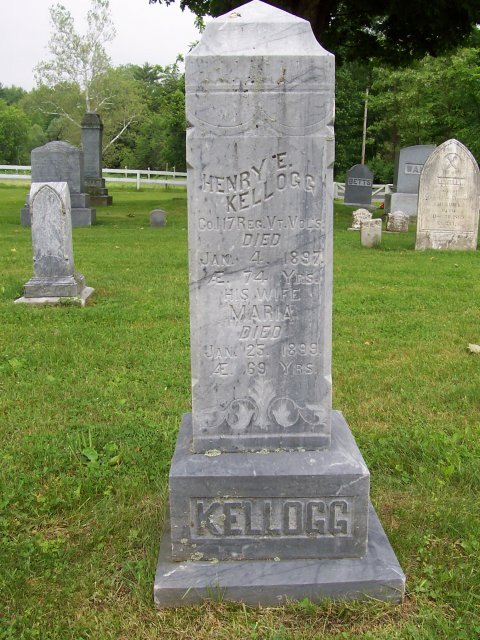 Only after his disability discharge from the service were there remnants of a paper trail found for Henry E. Kellogg. It was spotty and disparate but sufficient enough to paint a sad story of Henry's life. Where he lived and how he supported himself from 1864 to 1869 was unclear. It was assumed he returned to familiar people and places after he left the service which meant he came back to the New Haven area. Since he stated he was a farmer when he enlisted, it would be safe to assume he returned to that occupation when he was a civilian again. According to his military records, he applied for, and was granted, a pension beginning September 15, 1869. What amount he received was not stated. If his pension was awarded on the basis of his service related injury (loss of one eye), then it may have ranged from $11.04 to $99.36. Since he was declared to be 3/4 disabled by the military surgeons on his discharge papers, he was eligible for about $74 per month maximum. Later on in his Wills and Probate Records, it was discovered that Henry actually did receive a monthly pension of $72 each month from the Federal Government for the rest of his life. Along about March 15, 1873, the local newspaper was reporting that "Henry Kellogg, alleged insane" was having a hearing in the Addison County District Court to determine his mental capacity and fate. Apparently someone in the New Haven community was concerned about whether he was capable of caring for himself or not. Who that was and why they felt he was in need of management was not disclosed. Extensive searches in historic newspapers of the time produced no further information on the case either. Happier news came along in August of 1876. On the 14th of the month, in New Haven, Henry E. Kellogg of New Haven, married Maria E. Mansfield, also of New Haven. The vital record for the groom stated that his usual residence was New Haven, that he was fifty-two years of age, and that this was his third marriage, which was a complete surprise. Nothing in the public domain had ever indicated Henry had married before 1876, let alone twice before. But the card did provide other useful information like parental names. The father slot wasn't of much help as it only said "Kellogg", but the mother blank was filled in with a name: Polly Spencer. This was the first, last and only mention of a parent found. The bride card was also informative about Maria. It said she was forty-three years old and that this was her first marriage. She had been born in Colchester, Vermont the daughter of ____ Mansfield and Naomi _____. Although lacking in specificity, what data was given was somewhat helpful. The lack of diligent record keeping, while extremely frustrating, was not out of the ordinary. Again, the records did not reveal where the newly weds took up residence nor how they supported themselves. It was assumed the couple remained in New Haven or at least close by. Henry had his monthly pension which was a substantial amount of money each month by 1876 standards. Henry and Maria could comfortable live on his income alone which was about two times the average yearly income for a ordinary laborer of the times. It was a mystery why Henry did not show up in the Federal Censuses taken every ten years beginning in 1790. But he was not the first one missed by the census takers; just the first one missed in so many consecutive years that I have run across in my research of Civil War era veterans. Perhaps "imbeciles" were not counted back then. Likewise there was no accounting for Maria in 1850, 1860 or the 1870 U.S. Federal Census. The first, and only, Federal Census year they were listed was the one taken in 1880, four years after their marriage. They both were listed together as members of Arba F. Mansfield's household in Bristol, Vermont. Arba (aka Arbie) was Maria's brother. He was a wagon manufacturer, married to Sarah and had two children of his own. He also shared his house with another married couple named James Whitney (60) and his wife, Almira (45). Henry, who was fifty-six, had no occupation. Maria, fifty, was listed as a "domestic servant". Araba's vital records were important because they revealed his parent's full names. His death card said his father was Stephen Mansfield and his mother was Naomi Fitts.This information was never able to be verified. It was mentioned earlier that around 1873 a court inquiry into the mental stability of Henry had been instigated by a party or parties unknown in the New Haven community. It was noted at the time that the adjudication of that inquest was unresolved and that no further information could be found as to the court's ruling on the matter of whether Henry was capable of taking care of himself or not. Some light was shed on the outcome when Henry's Will and Probate Records were examined. Remember that Henry had married in 1876. Probate Records show that by at least 1889 both of them had a legal guardian to oversee their affairs. This arrangement lasted for each one of them until their deaths. In fact, it was discovered that for those years from 1889 until 1899, the couple were boarded with three different adults within the New Haven-Bristol communities: Arba F. Mansfield, Mr. Hagan and F.O. O'Bryan. And they had two court appointed legal guardians during that time also - Mr. Dorastus Wright Nash and Mr. H.S. Sumner. Mr. Nash was a prominent and well known pillar of the New Haven community who spent much of his life serving people. He was administrator for dozens of estates in the community. He also was widely known for his philanthropic care for the needy in town. He was a gentleman farmer who dabbled in Merino sheep and thoroughbred Morgan horses. He served in both houses of the State Legislature as well. His obituary referred to him as the "Honorable D.W. Nash". Mr. H.S. Sumner, a successful local farmer in New Haven, was appointed guardian for Maria after Mr. Nash retired following Henry's death in 1897. What relationship, if any, he had with the Kelloggs was unknown. Mrs. Hagan and Mr. O'Bryan were both residents of the Bristol area and each was paid at various times to house and keep Henry and Maria. Arba was the only family member known to have boarded Henry and Maria right after their marriage in 1876. Mr. Nash was the legal guardian of Henry and Maria for the majority of the time documented by the Probate Court papers covering the years 1889-1897. Actually, he officially began to be involved with the affairs of Henry back in 1879 when Henry named him executor in his will. They must have had a relationship even before then. It was Mr. Nash who saw to it that Henry's disability pension of $72 per month along with the interest earned on his deposits were religiously banked. It was he who made sure the expense of boarding Henry and his wife was paid ($208 per year). He was the one who made sure that Henry had his whiskey and tobacco. When either Henry or Maria needed new clothing, it was Mr. Nash who bought them shirts, shoes, hats or dresses. When Maria needed seven yards of flannel or buttons, Mr. Nash purchased them. He bought tickets when they made a trip to Burlington. Paid for dinner and trolley fares when they all went together to the big city. He was the one who made sure the taxes were paid. He gave Henry and Maria pocket money when they asked for it. He paid the doctor when necessary and paid for the medicines and groceries at C.F. Squire's store. In short, D.W. Nash was the one who provided for all the basic needs of Henry and his wife during their lifetimes. He was also responsible for seeing to it that their lives went beyond merely surviving and included a certain degree of quality to it. He lived up to his reputation as a magnanimous man. The 1890 Special Schedule for veterans was the last official recorded document found that traced Henry's whereabouts. It placed him living in New Haven, made no mention of a wife and erroneously stated his military service as being two years, eleven months. Actually, it was more like six months active duty with about four of those spent incapacitated in the hospital with varicose veins, an inflamed eye and a bad case of imbecility. It did note, accurately, that he was blind, but failed to mention that it was only in one eye. Henry was getting up in years by 1890. He had reached his sixty-seventh birthday when the special schedule was conducted. The number of doctor's bills paid by Mr. Nash over the years did not suggest that Henry suffered from any serious health issues, yet in his seventy-third or fourth year of age, he died, presumably in New Haven, on January 4, 1897. Sometime around April 5, 1897, Mr. Nash, getting on in years, relinquished his position as guardian of Henry's wife, Maria, and turned the job over to another local man named H.S. Sumner whom the court had apparently appointed as the new guardian of Mrs. Kellogg. He served as her legal guardian until her death on January 27, 1899 in Bristol from injuries suffered in a fall at the age of eighty-one years. 1. www.findagrave.com, Memorial #40154022 for Henry E. Kellogg. 2. www.ancestry.com, Vermont, Wills and Probate Records, 1749-1999, for Henry E. Kellogg; Ibid., 1880 U.S. Federal Census for Marriah S. Kellogg. 3. www.fold3.com, Compiled Service Records of Union Soldiers Who Served in Organizations From the State of Vermont, p. 3, image 312165513. Hereinafter referred to as Compiled Service Records. 4. Ibid., Compiled Service Records, p. 4, image 312165516. 5. Vermont in the Civil War/Units/17th VT Inf./Introduction & History; www.en//civilwarintheeast.com/us_regiments_batteries/Vermont/17th-vermont. 6. www.fold3.com, Compiled Service Records, p. 11, image 4312165533. 7. Senate Committee Print, Compensation or Pension To Veterans or Their Dependents, Rates of Compensation, Sept. 1, 1948, U.S. Printing Office. 8. www.ancestry.com, Vermont, Wills and Probate Records, 1749-1999 for Henry E. Kellogg. 9. www.newspapers.com, Middlebury Register, Tues., Apr 8, 1873. 10. www.ancestry.com, Vermont, Vital Records, 1720-1908, Marriage for Henry E. Kellogg & Maria E. Mansfield. 11. Ibid., 1880 U.S. Federal Census for Arba F. Mansfield. 12. Ibid., Vermont, Death Records, 1909-2008 for Arba F. Mansfield. 13. Ibid., Vermont, Wills and Probate Records, 1749-1999 for Henry E. Kellogg. 14. www.newspapers.com, Middlebury Register, Fri., Jul 7, 1905. 15. www.ancestry.com, Vermont, Wills and Probate Records, 1749-1999 for Henry E. Kellogg. 16. Ibid., Account sheets to Probate Court for estate of Henry E. Kellogg. 17. Ibid., 1890 Veterans Schedules for Henry E. Kellogg. 18. www.findagrave.com, Memorial #40154022 for Henry E. Kellogg. 19. www.ancestry.com, Vermont, Wills and Probate Records, 1749-1999 for Henry E. Kellogg. 20. Ibid., Vermont, Vital Records, 1720-1908 for Maria Kellogg.